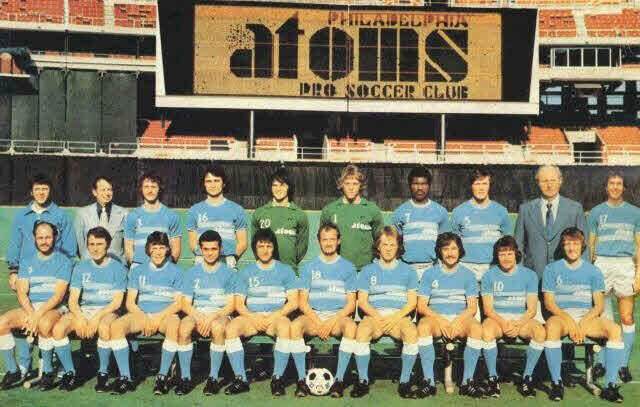 The Philadelphia Atoms joined the NASL as an expansion team in 1973. They were the first expansion team to win a championship in its first year in any American professional sport. That they accomplished this with a squad managed by an American coach that was largely made up of Americans – many of whom were local products – led to the first Sports Illustrated cover to feature a soccer player. Their victory was in no small measure responsible for saving a then faltering NASL from dissolution. Philadelphia soccer history has many important examples of teams that were backed by businesses: the John A. Manz team, who in 1897 became the first team from outside of Southern New England/Northern New Jersey to win the AFA’s American Cup, was backed by a brewer; Bethlehem Steel FC, the most dominant team in American soccer of the 1910s and 1920s, by the steel company; Uhrik Truckers, winners of two ASL championships in the 1950s, by a trucking company. With the exception of Bethlehem Steel, all of these teams, however, competed in leagues that were either amateur or semi-professional against teams that were largely backed by the kinds of ethnic social clubs that have contributed so much to American soccer history. The Philadelphia Atoms were part of a new trend in American soccer toward professionalism in which teams, backed by business owners or groups, would have unprecedented media coverage on a national scale. The resulting soccer explosion of the 1970s led to the rapid expansion of youth soccer programs across the country. This in turn led to the movement of soccer into the national sport consciousness, the rise of the US national team as a legitimate power in world soccer, and the eventual establishment of a stable and growing professional league. Want Super Bowl tickets? Buy a NASL franchise. Atoms team owner and founder Tom McCloskey had little or no experience with soccer. He did have experience with professional sport, having owned the minor league Philadelphia Ramblers of the Eastern Hockey League. He had also served as president of the Liberty Bowl, the college football bowl game that at one time had been located in Philadelphia. McCloskey was a “Philadelphia construction magnate” whose list of construction projects included the Philadelphia Mint, Centre Square, the Mann Music Center, Veterans Stadium, the Spectrum, and RFK Stadium. Early in 1973, McCloskey, who most of all wanted to own an NFL team, found himself with eight friends at Super Bowl VII in Los Angeles without tickets. Lamar Hunt, the sports entrepreneur who, in addition to owning the Kansas City Chiefs, had an interest in the NASL through his ownership of Dallas Tornado, heard about McCloskey’s plight. Waving nine Super Bowl tickets, Hunt asked McCloskey, “How would you like to have a soccer franchise in Philadelphia?” $25,000 later, the Philadelphia Atoms were born. With little more than three months to build a team before the May 5th season opener, McCloskey’s lack of soccer knowledge would inadvertently become a benefit. He appointed as general manger of the Atoms Bob Ehlinger, who also had no soccer experience. But he was a vice president of marketing for McCloskey’s company and had 20 years experience as a referee in college football. Following the example of American professional football when trying to find new talent, McCloskey and Ehlinger looked to the American college soccer scene for their choice of manager for the new club. The man they chose was Al Miller, a successful soccer coach at Hartwick College and eventual Hall of Fame Member who had grown up in the Philadelphia area and had been an All American player at East Stroudsburg. Miller’s experience with soccer at the college level led him to make perhaps the singular most important decision in establishing the quick rise of the Atoms: rather than build a squad around foreign players, which until then was how NASL teams went about building their rosters, Miller would build his squad around American-born players. That they would be players with local roots would only make the story of a magical season better. The Atoms had the first pick in the NASL college draft and Miller chose Bob Rigby, who had grown up in Ridley Park, and had played at Miller’s college alma mater. His next choice was Bobby Smith, who had grown up in Trenton and played college soccer at Rider University. Miller then acquired Barry Barto from Montreal Olympique. Barto had grown up in Philadelphia and was coached at Philadelphia Textile by future Hall of Fame member Walt Chyzowych. From the New York Cosmos Miller signed University of Pennsylvania product Stan Startzell. Charles Duccilli, who had graduated from Germantown High School before setting the record for most goals scored at Temple University and was was the ASL’s Philadelphia Spartans leading scorer in 1971, joined the team. Casey Bahr, fresh out of a three year stint in the Navy after graduating from the Naval Academy and son of the legendary Walt Bahr, also came aboard. The team went to England to train at Lilleshall, site of the National Recreation Centre in England and training ground of the 1966 World Cup winning England team. Steve Holroyd writes, “By training in England, Miller hoped to impress his young Americans with a top-flight facility in a ‘real’ soccer country. Also, it gave him the opportunity to fill out his squad with British players who played the fast-moving style Miller preferred. As the NASL played a summer schedule, a number of English players were available ‘on loan’ to American clubs.” Miller signed three players from Southport FC, who had just won promotion to League Three as League Four champions: Andy Provan, Jim Fryatt, and Chris Dunleavy. Philadelphia had a new professional soccer team. The team had been built from scratch in a few short months by a daring young coach with a roster of largely young American players with Philadelphia-area roots, mostly filled out with a few older veterans of lower division English league football. Would the city embrace the new team? Would anyone come to see them play? Would the team be any good? Pingback: The Philly Soccer Page » It’s Union time!